Your interactions with Facebook just got a bit more human. 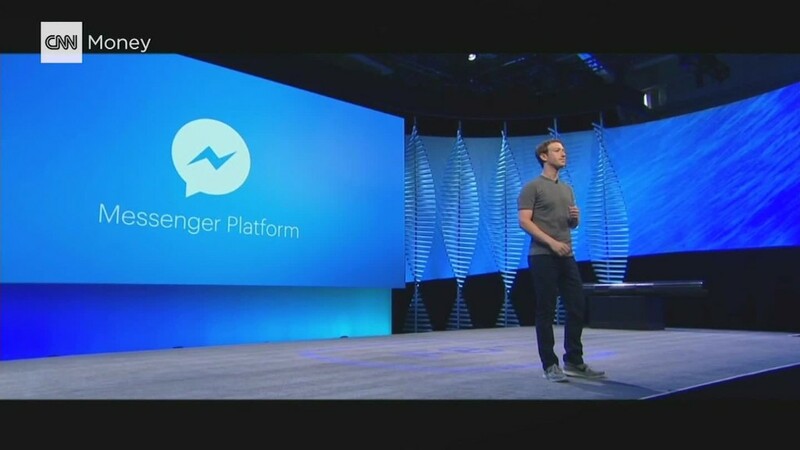 At F8, its annual developers conference, the company announced Bots for Messenger. Users will be able to get everything from weather updates to shopping notifications to personalized news from a range of companies including CNN -- all through Facebook's messaging app. People will now be able to message companies and publishers like they would message their friends. "A lot of people are thinking about bots in a geeky way -- we'd like to think of bots in a different way," Facebook's VP of messaging products David Marcus told CNNMoney. But Marcus paints a picture of a world where your boarding pass is available in one tap on Facebook Messenger. It's the same place you can book a table at your favorite restaurant, print a photo and find a ride. Bots for Messenger is launching with a few dozen partners, including HP, shopping app Spring and CNN. HP (HPQ) built a tool that lets users print a photo by sending it to the company's printing bot on Messenger. Once a user sends a photo, the bot responds conversationally (i.e. "Hey, nice photo,") and gives printing options. Users can connect to their personal printers or send photos to locations around the world, HP Innovation Manager David Parry told CNNMoney, adding that bots are still in their early stages. "[Eventually, bots will be] able to handle very administrative tasks in a very easy way -- reservations, hotels, banking -- as AI is able to anticipate needs and proactively talk to you, it'll get more exciting," he said. Through CNN's bot, users can message topics like "zika virus" or "politics" and CNN will respond with related stories and information on the topic. There's an "Ask CNN" feature where you can ask questions like, "What's the latest on the 2016 election?" It will also feature a "stories for you" tab based on what you've clicked on in the past. Over time, the bot will get to know you better and serve you more personalized stories. CNN's chatbot responses will be conversational, Samantha Barry, head of social media at CNN, said. "You'll see that we are using a lot of personal pronouns 'I, me, you' because it's fitting with the messaging space." "A personal news experience is all about context -- from the person's location to the time of day to the stories that matter most," said CNN's Chief Product Officer Alex Wellen. This is the start of CNN's play into messaging, he said, adding that the company is exploring ways to enable chats on voice-activated technologies like Alexa, Siri and Watson. Spring is another early tester of Bots for Messenger, with its Personal Shopper bot. It will serve up personalized suggestions based on your shopping preferences and send a confirmation when users make purchases on Spring. The bot will ask you a set of questions -- from what items you're interested in to your price range -- and then serve up suggestions. Companies like Slack and WeChat are already utilizing bots. With 900 million monthly users on Messenger, Facebook will be able to cast a wide net. Its developer conference has historically been a venue for Facebook to unveil new features, from the "Like" button to Facebook Connect. Success will depend on the quality of Facebook's conversational bots -- and whether customers use them. Microsoft's attempt to create a teenage chatbot went awry after it started spewing racist comments on Twitter. Microsoft (MSFT) was forced to shut it down. Marcus said the types of bots built for Messenger will be fundamentally different than Microsoft's bot, nicknamed "Tay." "The goal of Tay was to build a conversational AI as an experiment," he said. Facebook's bots have a more clearly defined purpose -- all designed to simplify your life in some way. "It's almost like an app within a thread," he explained. Marcus said there will also be a process for bot approval and monitoring to ensure users have a good experience. Facebook (FB) is calling on developers to build bots for thousands of additional businesses, brands and publishers so they can directly connect with Facebook's users. "It's a new era," Marcus said. "A lot of companies can be built around this opportunity."